The highest level of technical museology. The highest level of science-focused photojournalism and imaging. The highest level of large venue video projection and pixel mapping. On the National Mall in the nation’s capitol, the week before Thanksgiving, one event combined those three activities important not only to this writer but to our industries in general. As invited press to the opening gala for Nature’s Best Photography Windland Smith Rice International Awards Exhibition, held on November 16th at the Smithsonian National Museum of Natural History in Washington DC, it did not take long to remember– in this year of both tumultuous politics and blurring technology market boundaries– why I love this industry. Even in a world of images anywhere, and fractious politics everywhere– celebrating both the highest levels of imaging and the highest level of civic cultural stewardship is still exhilarating. Exhilarating it was, the Awards gala held at the Smithsonian National Museum of Natural History. The mission of the Awards program? Launched in 1996, the Nature's Best Photography Awards is an endowed exhibition program run in partnership with the Smithsonian National Museum of Natural History—one of the most-visited museums in the world. Chosen from more than 26,000 entries from photographers, the exhibition showcases 60 images from the extraordinary work of nature and wildlife photographers in 59 countries. The images, along with an accompanying video, are displayed as large format prints ranging in size from 2 x 3 feet to nearly 4 x 6 feet in the museum, which welcomes more than seven million visitors annually. The exhibition prints were created on a 44-inch Epson wide-format printer that delivers superb photographic prints with extraordinary color, rich blacks, and exceptional print permanence levels. For the pixel mapping on the walls/columns behind and above the stage, six of Epson’s flagship laser phosphor projectors (introduced last year), the Pro L25000U, 3-chip 3LCD 25,000 lumen model, were brought to task, in both portrait and landscape modes. Two Epson ProL1405 projectors, with ultra short throw lenses, provided the rear projection for the IMAG screens on either side of the stage. “It's more important than ever to cultivate public interest in environmental conservation, and the annual Nature's Best Photography Windland Smith Rice International Awards exhibition encourages the public to engage in celebrating the beauty that nature has to offer and thus be moved to preserve it,” said Steve Freligh, awards director. While there are student categories and some amateurs in the program, it is at its heart a curation of the most impressive photography being done today by researchers and wildlife conservationists in the field (mainly) and professional photographers committed to wildlife preservation. The 22nd annual Nature’s Best Photography Windland Smith Rice International Awards Exhibition opened Tuesday, Oct. 24, 2017 at the Smithsonian– and will run through September 2018. Chosen from more than 26,000 entries from photographers, the exhibition showcases 60 images from the extraordinary work of outdoor photographers in 59 countries. The images, along with an accompanying HD video, are displayed as large format prints ranging in size from 2 x 3 feet to nearly 4 x 6 feet in the museum, which welcomes more than seven million visitors annually. The exhibition prints were created on a 44-inch Epson wide-format printer that delivers superb photographic prints with extraordinary color, rich blacks, and exceptional print permanence levels. The tie-in to pixel mapping? 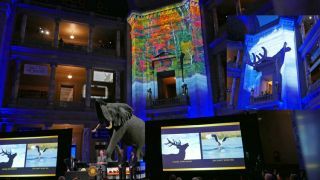 Epson, as global sponsor of the program, ramped their sponsorship way up this year by integrating projection mapping and large-scale projected imagery at the invitation-only awards ceremony and reception Nov. 16th. Epson partnered with several high-end live event solutions companies to create a projector mapping display during the private reception, including All of it Now creative design agency, Da-Lite for custom screens, and Nomad Event Systems for the production. The company Disguise (formerly– up until last week– called D3 Technologies) provided the servers for pixel mapping. The pixel mapping was engineered by All of It Now, the creative design agency based in San Francisco specializing in live digital video production, interactive design, and 3D projection. Danny Firpo and Howard Wong from All of it Now flew in from a Halsey tour stop in Canada for the gala event. As pixel mapping goes, the work at the awards ceremony was just the right amount– not so much a loud splashing of pixels around the huge space that would distract from the events on the stage and the photography being celebrated, but just enough to provide a beautiful counterpoint–above the crowd and the stage on three “corners” of the space– to the static images of winning photographs being projected on the IMAG screens. Allen Johnson, technical director at Nomad– the staging company for the event for all audio, IMAG, and the pixel mapping design by All of it Now and Epson. For the pixel mapping, six of Epson’s flagship laser phosphor projectors (introduced last year), the Pro L25000U, 3-chip 3LCD 25,000 lumen projectors, were brought to task, in both portrait and landscape modes. Two Epson ProL1405U projectors, with ultra short throw lenses, provided the rear projection for the IMAG screens on either side of the stage.